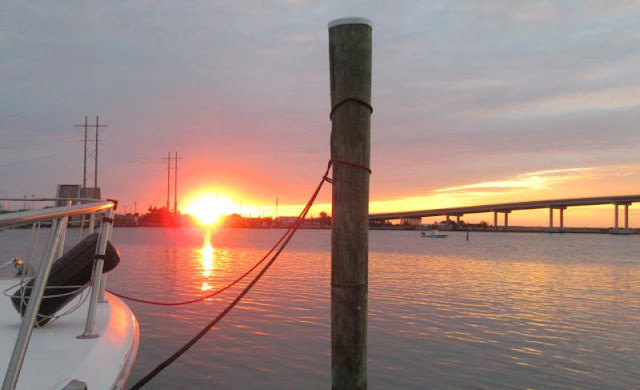 Pungo Anchorage - what a night! The winds were supposed to be less than 8 kts out of the northeast by they were actually 15 kts out of the east. It seems that you can always just double the wind prediction for the Neuse and Albemarle. The predictions are never right, they always seem to under estimate the wind. This statement includes PreidictWind, NOAA, PocketGrib, Windy, etc. Fortunately for us, the wind was behind us once we turned the corner to head down the Neuse. It was very rocky before that. One thing you never want to do is to go against a 15 kt or higher winds on the Neuse. It's shallow and the waves tend to be very short period and build up nicely. We didn't see any debris except for one lone piece just north of Adams Creek. The creek itself was completely free of debris. I was surprised at the lack of damage by Florence. I had expected to see many houses badly damaged or destroyed, not so. The houses showing damage were in the minority. I would bet that a TV crew would focus on the damaged houses as opposed to giving a balanced overview of the effects of hurricane Florence. Here we will do doing a wash and pay a visit to the nearest supermarket to provision for the rest of the trip to Titusville. We are out of everything fresh. The marina here has a free courtesy car which we'll take advantage of on Monday. The next day we'll see how ground zero fared as we head down the ICW.